Hey friends!! 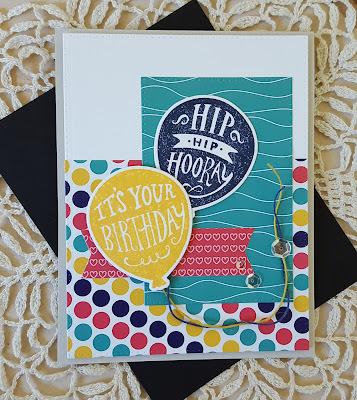 Stopping in with a card that I put together yesterday evening for a few challenges: CAS(E) this Sketch, Essentials by Ellen Pin-Sights challenge, Simon Says Stamp Wednesday challenge (anything goes) and Time Out (home sweet home). 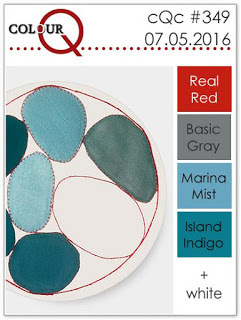 I haven't played along with a Time Out challenge in quite sometime, but when I took another look at the inspiration photo I realized that my card would fit with their challenge (the red throw and blue end tables). The EE Pin-Sights challenge is full of lot of fun images in red and blue. 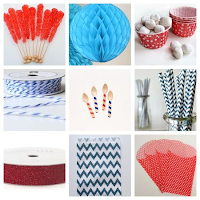 I took my inspiration from the blue honeycomb decorations, as well as the color red and created a little cluster of red balloons. For the background of my panel I scribbled on some blue using a ZIG Prussian Blue clean color marker on watercolor cardstock and then moved the color around with a wet paint brush. Once that was dry I added the clouds from the EE set Up the Happy in a darker blue. 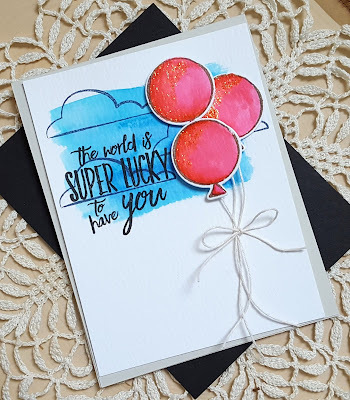 The balloon (also from Up the Happy) was stamped three times using VersaFine Vintage Sepia on watercolor paper and then colored with a ZIG Carmine Red clean color marker and clean water. Once the balloons were dry I die cut them and added some Diamond Stickles for a bit a glitter (inspired by the roll of red glitter tape). Some thin white hemp twine was secured to the back of the balloons and once they were arranged and adhered I tied the strings together. 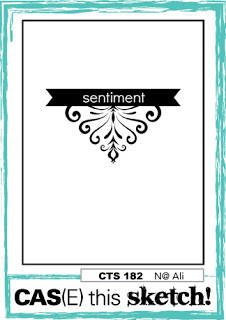 The sentiment (from Up the Happy) was stamped in VersaFine Onyx Black. Thanks for stopping by today... would love to hear your thoughts! Hey friends!! Hope your week has been going well. We have been having some beautiful weather here in the Pacific Northwest!! With all this good weather my crafting time has been cut down, but I did find time to create a little card for the current CASology challenge. 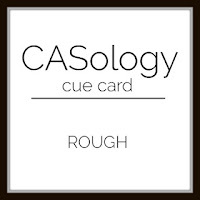 Yep... Lisa and I are continuing our personal little challenge revolving around CASology. 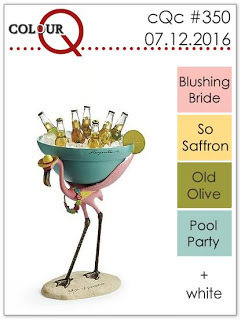 I also used the layout from Freshly Made Sketches and the color combo from ColourQ so I will be adding my card to those lineups and the current Simon Says Stamp Wednesday challenge of anything goes. 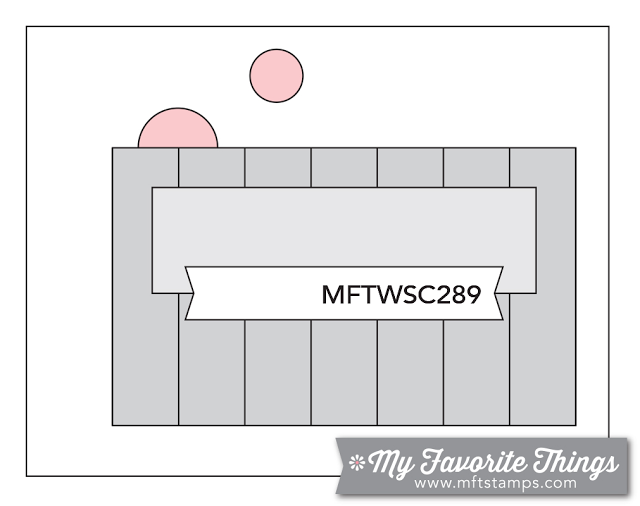 I have had the Concord & 9th Map Love stamp set for well over 6 months and have been wanting to make something with it. When I saw the CASology cue word of Journey I immediately thought of this set. I realize that some may not understand what connection my card may have to the cue word, but there is one, lol! Obviously the earth journeys around the sun, but love is also a journey and one of the most rewarding journeys that we will ever take!! I also think that stamping is a journey. 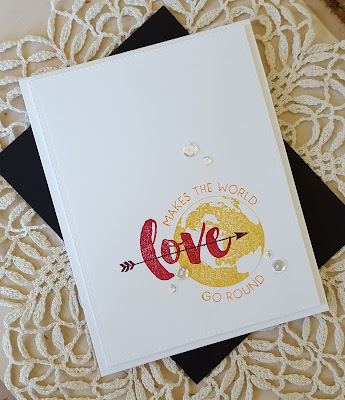 When I started my stamping journey I didn't know much, but as I have traveled this road I have learned a lot, had a lot of fun and met some pretty nice people! So... there you have it... my take on the cue word. Now that I have that explanation out of the way I will say a little bit about my card which is pretty straight forward I think. I thought the FMS layout was perfect for this type of card. Lots of white space, a nice visual triangle created by the sequins and a pleasing arrangement of the colors. Oh... and I managed to have pretty much everything in the lower third of my card! This kind of card reminds me why I like clean and simple designs so much! Thanks for stopping by today... would love to hear your thoughts on my card! 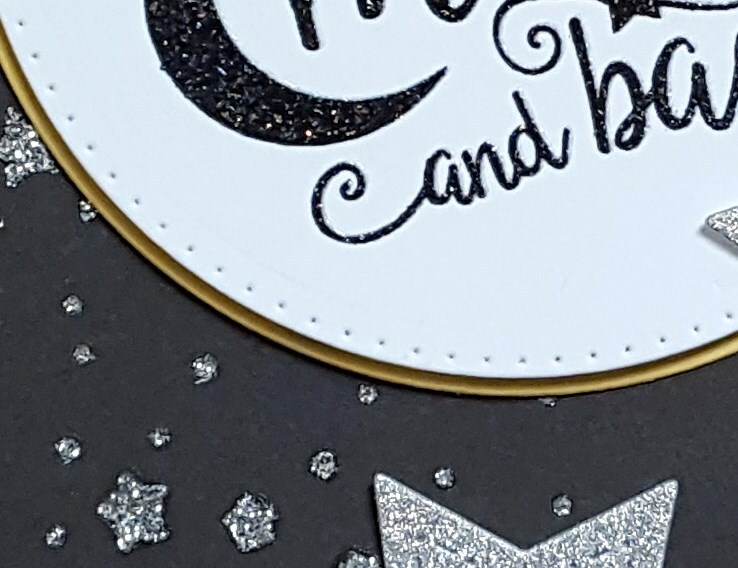 Please make sure you head over to Lisa's blog to check out her card. I know it is going to something super clever! Hey friends!! Popping in to let you know that I have a post up on the AJVD blog. 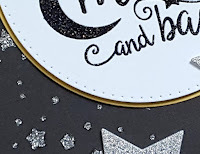 Here is a little peek of my card and can I just say that I absolutely love how this card turned out??? Hey friends!! Stopping in on this lovely morning with a card for this month's PTI blog hop. I only got one card made for Stamp-a-faire as the weather has been so nice and my boys wanted to get out and do some things. 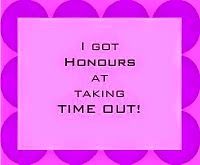 I did manage to get a card made for the blog hop. 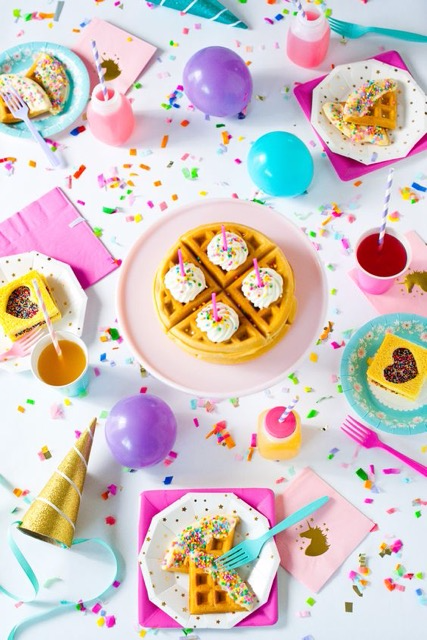 The inspiration photo is so pretty and I had a definite idea in mind, but I just could not make it happen with the first two stamp sets I tried! I finally pulled out Garden Grace and was able to make my idea happen. I die cut some Soft Stone cardstock with my Quatrefoil coverplate and then cut away about 2/3 of it to create a lattice looking corner piece. The white panel was die cut with the largest Double Ups die and the lattice adhered to that. I die cut the floral image and then stamped it using two shades of orange and two shades of green. Unfortunately it didn't stamp very well in the center of the floral image, but at that point I had been trying to make a card for about 2 hours so I embraced the less than perfect look and went with it, lol! 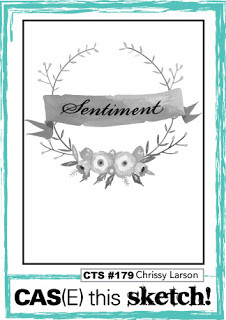 I stamped the sentiment, also from Garden Grace, and then adhered the floral image in place. Some bright blue sequins were added to bring in that little pop of bright blue you see in the inspiration photo. I also sprinkled some tiny clear sequins around on top of the image. I'm going to post this to the current Simon Says Stamp Monday challenge to add texture. Thanks for stopping by today... would love to hear your thoughts!! Hey friends!! 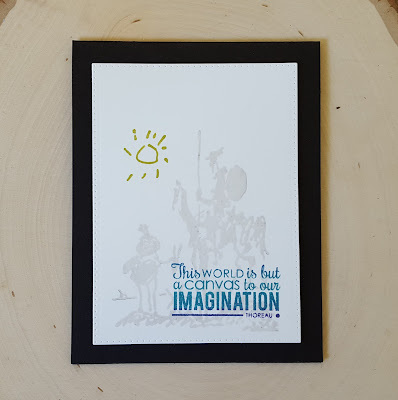 I'm sure that many of you spent the day yesterday watching all the wonderful videos the PTI design team put together for Stamp-a-Faire Masters and then making cards. I watched the videos, but didn't get anything made. 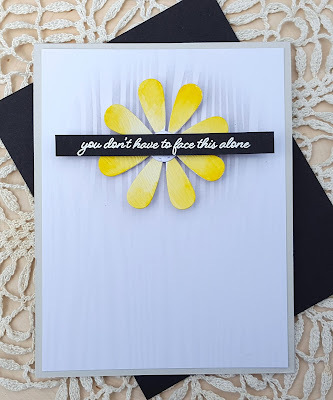 This morning I put together a card for Danielle's Gilded in Gold challenge. 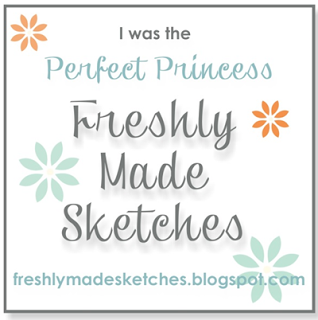 I used the color combo from ColourQ and the layout from Freshly Made Sketches so I will be adding my card to their galleries, as well. I noticed that the pattern in the inspiration photo from ColourQ looked like peacock featehrs so I decided to use PTI's Feather Finery for my design. 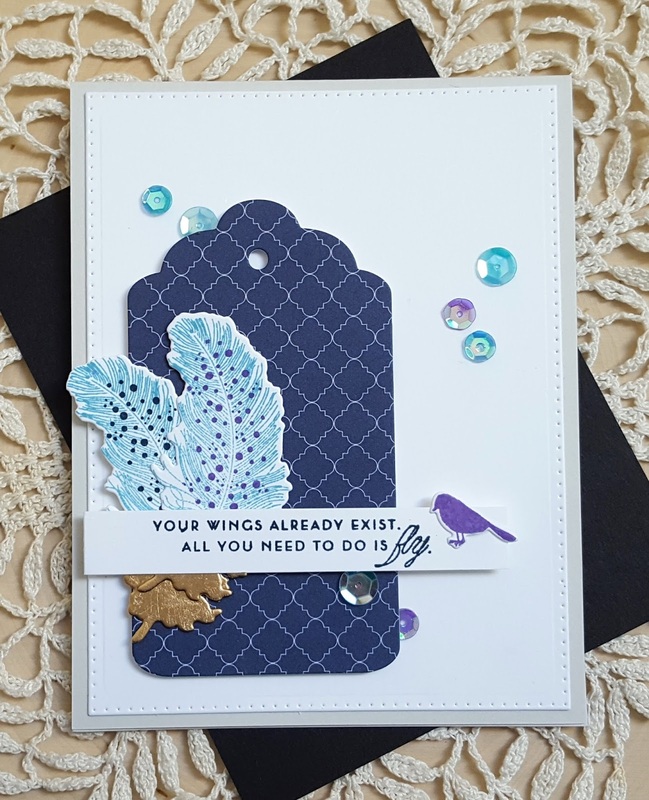 I die cut the smallest feather in the Feather Finery set twice and then stamped the feathers in teal. The dots were added in dark navy to one and purple to the other. The bottoms of the feathers were then gilded with the Liquid Leaf in Classic Gold. All the other pieces were die cut and layered and then I finished things off with some sequins in teal and purple. This may be the only project I get completed before the Tuesday deadline. Tomorrow is the July PTI blog hop and I want to get something made for that. Another Round of CASology with Lisa! Hey friends!! Well... Lisa and I are at it again. We have challenged each other to make a card using this week's CASology cue word of rough. 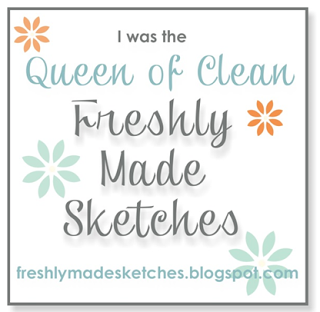 I also used the new layout from CAS(E) this Sketch so I will be adding my card to their gallery, as well. I have been wanting to get some woodgrain cardstock for sometime now and when I was at my local craft store, Artco, I saw that they were carrying Tim Holtz Distress Woodgrain cardstock so I picked up a packaged. When I saw the cue word it made me think of the woodgrain carstock as it has a rough texture. I die cut a daisy from the cardstock using an A Jillian Vance Design Daisy Trio die set and then I colored it with a yellow ZIG Clean Color marker (I just can't seem to create a card without them right now!!) and some clean water. 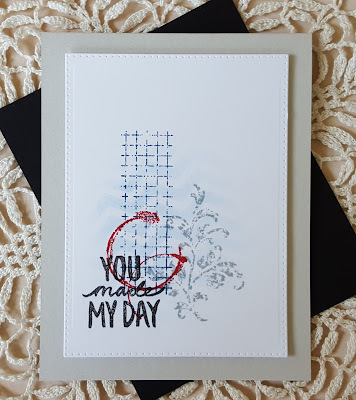 The sentiment (which also fits the rough theme) from the A Jillian Vance Design Get Well Wishes was stamped on black cardstock using VersaMagic watermark ink, I applied white embossing powder and heat set it. I think I will add the sentiment "I am here for you" to the inside of the card. 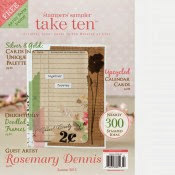 The background cardstock is Tim Holtz Motif Resist cardstock and also has a woodgrain texture. I applied some light grey ink to the resist cardstock for a subtle background for the daisy. Today has been a weird day with is sort of gloomy, but then sort of sunny. It made it hard to get a good picture of my card and in most of the pictures you could not see the grey inked background. Finally I was able to get a good photo this afternoon! Thanks for stopping by today... I would love to hear your thoughts! Make sure you check out what Lisa made... I know it will be something super clever!! Hello friends!! Tomorrow is PTI's annual Stamp-a-Faire and this year it is all about the Masters. Tonight is the Friday night gallery reception where Nichole is asking us to share one of our favorite cards or "masterpieces". 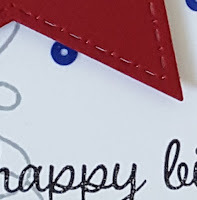 I took a quick through my photo folder of cards that I had made and came across this photo of a card that I think I made for a PTI blog hop in November or December. I absolutely loved how the card turned out. 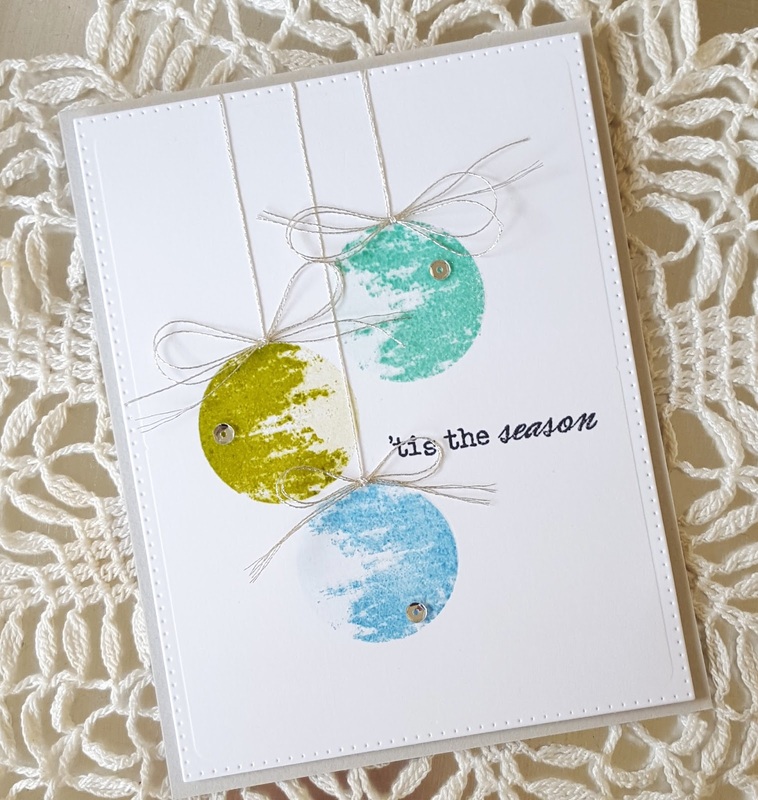 I used the Brushed Off stamp set to create my ornaments. 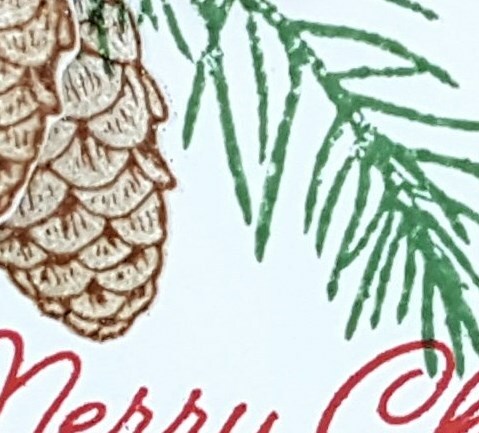 What I loved about the card is that while it is very modern in the style and the colors I used for the ornaments it is also slightly traditional. I liked the layout of the card so much I actually used it for a publication call that I responded to and the card inspired by this card got picked for publication! Thanks for stopping by for a look... would love to hear your thoughts! Thanks for stopping by today... I would love it if you would head over to the AJVD blog for a look and to let me know what you think! Hey friends!! Popping in with a super simple little card that I made using the current layout from Freshly Made Sketches as well as the colors from ColourQ. 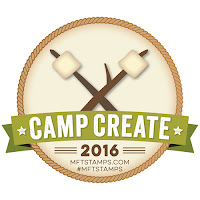 I recently purchased the Stampin Up! 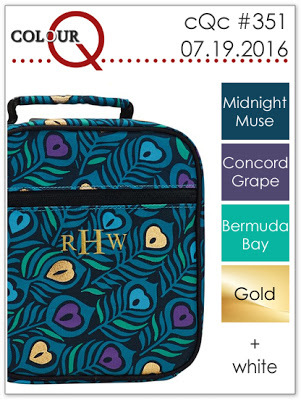 set Swirly Bird and the matching dies. I have been wanting to make something with them and thought the FMS layout would be the perfect vehicle. I turned the sketch upside down so that my wave wouldn't look silly up at the top of my card. 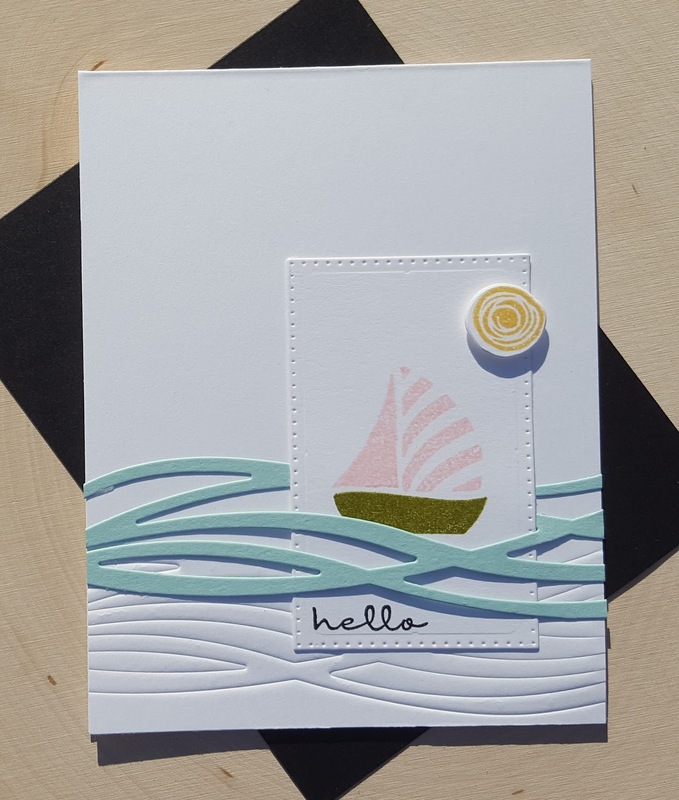 I die cut the waves from Pool Party cardstock and then stamped all the parts of the sailboat using all the other colors. The little rectangle panel was die cut using one of the smaller Polka Dot Rectangle dies from AJVD. 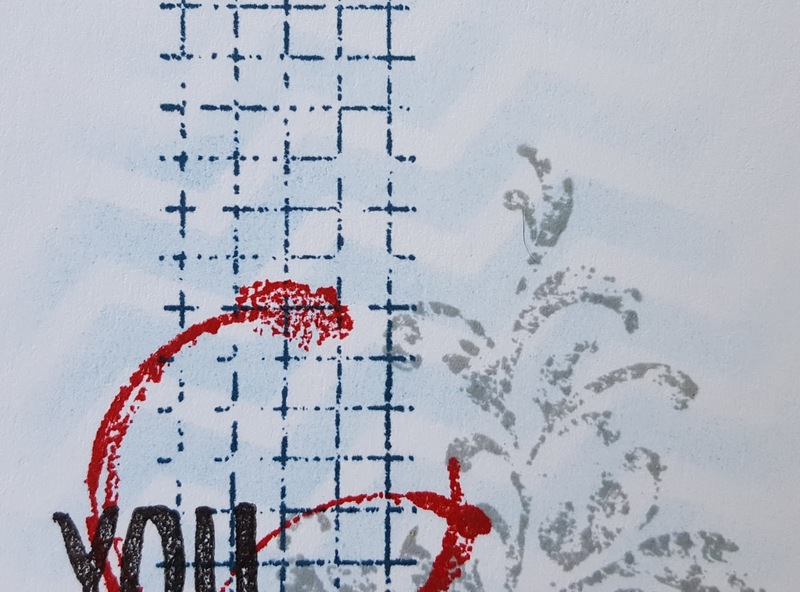 As I was layout out my design I decided to emboss the waves on to the bottom of my cardstock. Because I don't often use my dies to emboss I frequently forget how to do it. Thankfully I remembered correctly this time and the embossing turned out perfect! I slid the panel in between the die cut waves and then adhered the entire piece to my card front slightly overlapping the embossed waves. Once I had that done I realized that I should have figured out where I was going to place my sentiment before I did that, but I was able to save the day by stamping the small "hello" sentiment from a MFT set down at the bottom of the panel. I will also add this to the Simon Says Stamp Wednesday challenge of create a scene since I did create a little scene with my sailboat. Hey friends!!! 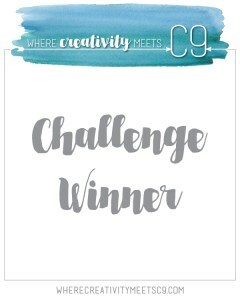 Lisa and I had so much fun last week challenging each other to make a card for the CASology challenge that we decided to take up the challenge, again! This week the cue word at CASology is "art". When Lisa contacted me and asked if I wanted to do the challenge I emailed her back that I would give it a go, but thought I would have trouble. I can't believe how wrong I was, lol!! Within minutes of sending off that email I had an idea for my card. When my husband and I first started dating we would often go to different art shops. While we were at one I spotted an art poster of Picasso's Don Quixote. I'm not a huge fan of Picasso, but I absolutely fell in love with that particular Picasso so my hubby (then boyfriend) bought it for me!! Fast forward about 15 years and I found a stamp of Don Quixote and I just had to have it. I used that stamp on my card. I inked up the sun in some chartreuse ink and then the rest of the image in Simon Says Stamp Fog. The sentiment is from the Reverse Confetti set Peacock Pretties and was inked up using Hero Arts Mermaid Ombre ink pad. 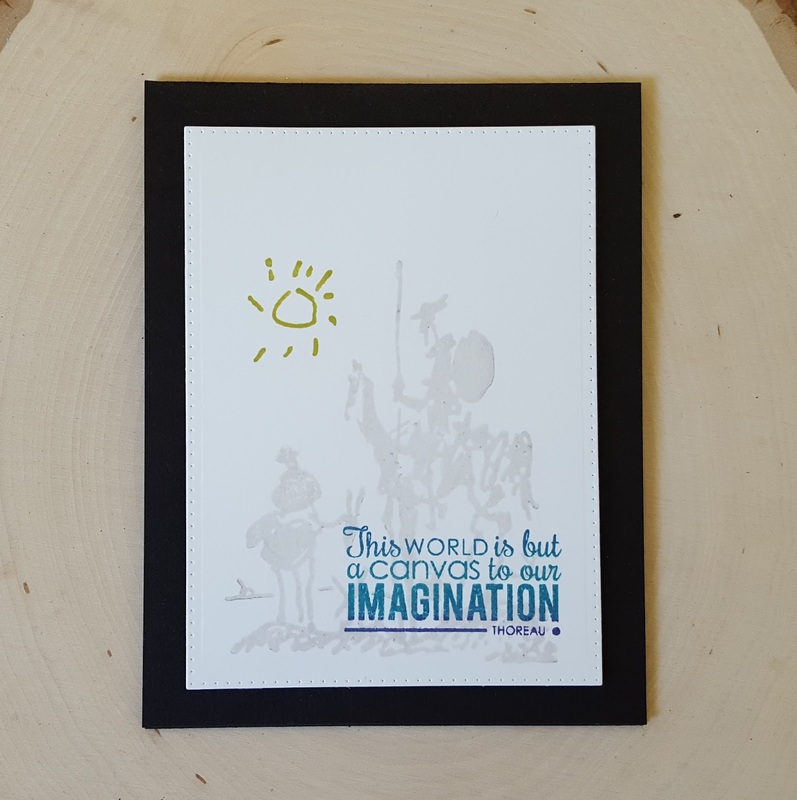 I die cut the image with a polka dot rectangle die and then mounted it on a black cardstock base. What better way to use the cue word then to use a piece of art! Thanks for stopping by... please make sure that you head over to Lisa's blog to see how she was inspired by the cue word! Hey friends! I'm back sharing the other cards I made over the last few days. 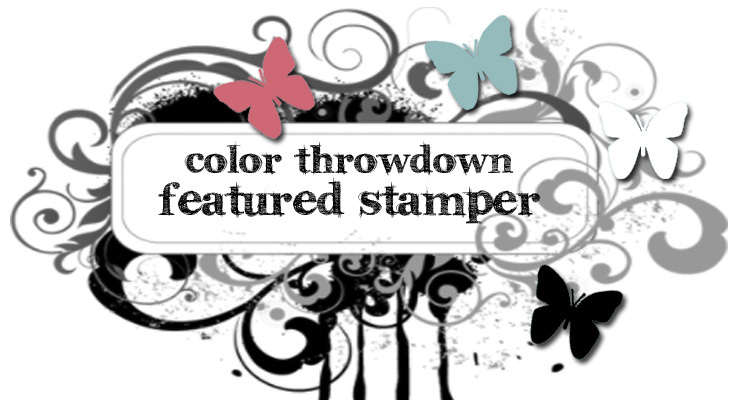 First up is a card for the current Simon Says Stamp Wednesday challenge, Simon Says Stamp Monday challenge, as well as the 30 Day Coloring challenge. 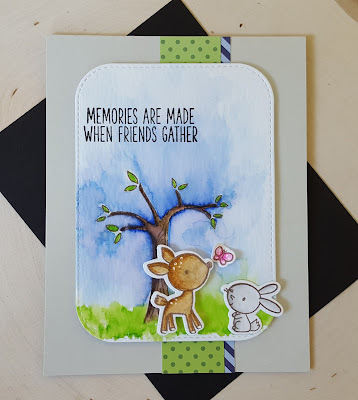 When I saw the SSS Wednesday challenge to create a scene I knew I wanted to use my MFT Sweet Forest Friends set again and do some watercoloring with my ZIG Clean Color makers. After I stamped the little deer image from the set the image of Bambi with the butterfly popped into my head and so I decided to create a little Bambi inspired scene with the deer, the bunny and one of the butterflies. I colored all the images with the ZIG markers and a number 2 round watercolor brush. Once they were dry I die cut them with the matching dies. 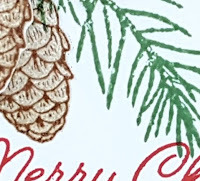 A panel of watercolor cardstock was stamped with the tree and then colored with ZIG markers. I watercolored the sky and grass around the tree image. Once the panel was dry I die cut it using the largest die in the Inside Out Stitched Rectangle dies and then adhered all the die cut images. I adhered some patterned papers from the MFT Dots & Stripes Fresh 6x6 pad to the cardstock base before adhering the panel I'm really pleased with how well all the images turned out. I'm learning that being patient as I watercolor is really paying off! 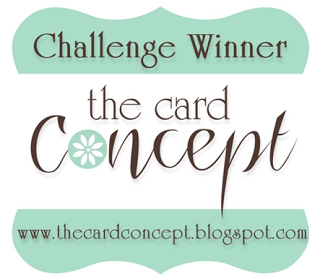 The second card is for the current Reverse Confetti Sketch for You to Try. Yesterday (one day early... they weren't supposed to arrive until today!!) I received some happy mail from RC... the Boxes & Balloons stamps and dies. I used them to make my card along with some By the Sea Quick card panels and the banner die from the RC Tag Me die set. Since all the Quick Card panels are perfectly coordinated putting together a card using them made everything quick and easy. I pulled out the yellow and navy colors from the polka dot panel to stamp the two balloons. I die cut the white panel using an AJVD polka dot rectangle die. The polka dot panel was also die cut with the same die so there is a nice clean look to the layers. 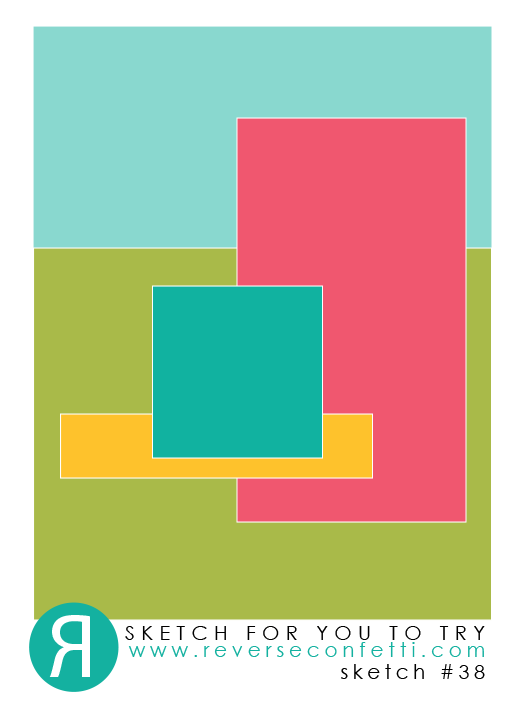 The smaller rectangle was also die cut with a polka rectangle die. The banner with the banner from the RC Tag Me set. After I die cut the balloons I added some hemp twine in yellow and navy to each balloon. The balloons were adhered and then I arranged the strings, adhered them and a few clear sequins to finish up the card. My niece turned 14 today and so this card will be going to her when we have her party next week. Hey friends!! I have been a busy little crafter the last few days! 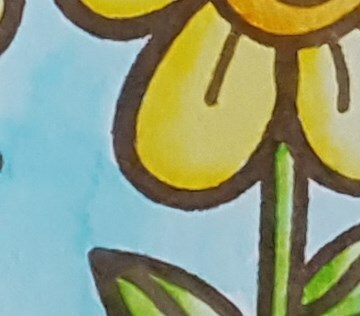 I have managed to make three cards and two of them involved watercoloring with my Zig Clean Color markers. One of those card was is for the current MFT Wednesday sketch challenge and I will be posting here. 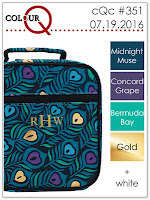 I will also be posting this to the Camp Create 2 Fabulous Foiling challenge, as well as Kathy's 30 day coloring challenge. I started my card by stamping one of the poppy images from Delicate Pretty Poppies multiple times on some Ranger watercolor paper using VersaFine Vintage Sepia ink. I then filled in some of the gaps with the little leaves from the same set also stamping in Vintage Sepia. My mini MISTI helped me get good impressions on the watercolor paper. I then colored all the images using the following colors: light carmine red, carmine red, bright yellow, yellow and may green and a number 2 watercolor brush. After some trial and error I have found a way to watercolor that works well for me and allows me to achieve the look I want. Once all the images were colored I colored around them using light grey. I also stamped another poppy and leaves on some scrap watercolor paper and colored them up. Once they were done they were die cut with the matching dies. I die cut my panel using the second largest MFT Inside Out Stitched Rectangle die. The "hello" (also from MFT) was die cut from black cardstock and then using a foiling glue pen (pursuant to a technique that I saw Kimberly demonstrate on the MFT blog) I applied the glue to the lower half of the word, allowed it to dry for a minute and then applied the foil. The foiling isn't perfect, but I do like how it turned out. I die cut a few more of the hellos and then stacked them all for some additional dimension. The sentiment is from the MFT set Amazing and was stamped using VersaFine Onyx Black and my mini MISTI. I adhered the watercolored panel to a panel of light grey cardstock, added the die cut flower and leaves to finish things off. 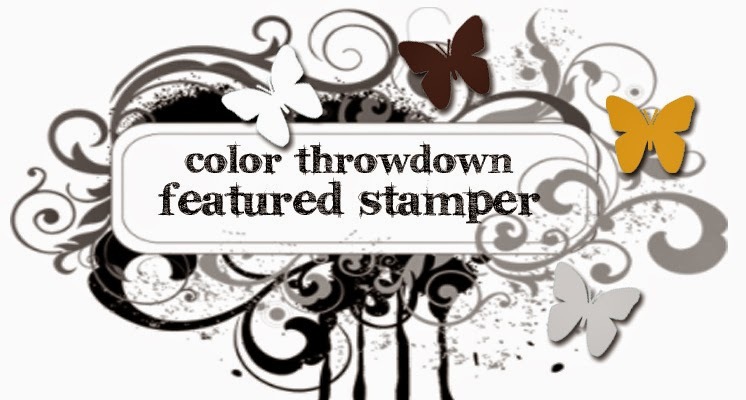 I'm adding this to the current Simon Says Stamp Monday challenge: floral and fauna. Hey friends!! Hope your week is off to a good start! Today was 7-11 and that means free small Slurpees at 7-Eleven stores! The boys and I met a friend and her son at our local 7-Eleven store, the boys got their slurpees and then we head to a near by beach to catch some sun. When I got home I finished up a card that I had started yesterday. The Hero Arts monthly kit for July is all about sea life... more specifically jellyfish, turtles and octopi. 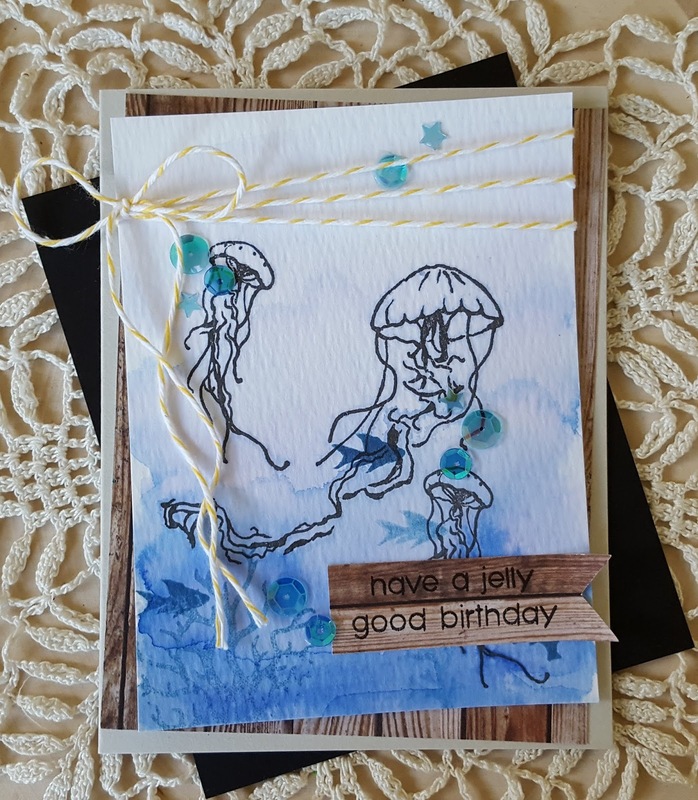 A subject matter definitely outside my comfort zone, but I decided to purchase the kit and made my card using a couple of the jellyfish images from the set. 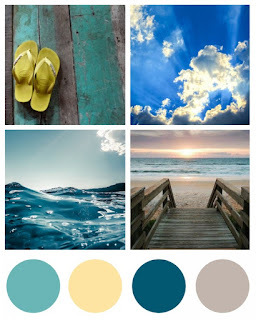 I'm using the color palette from the current Simon Says Stamp Wednesday challenge (photo inspiration) as it and the photo immediately made me think of the kit so I will be entering it there. 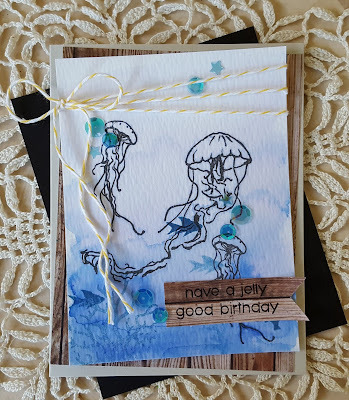 The new challenge at the Simon Says Stamp Monday challenge is flora and fauna and since jellyfish fit in the fauna category I will post it there, as well. I started by stamping the jellyfish in VersaFine Black Onyx and then I watercolored the panel with a blue Zig Clean Color marker. Once the panel was dry I added some of the smaller images (coral and a few fish) using one of the colors from the Hero Arts Mermaid Ombre ink pad. The panel was then cut down and wrapped with some yellow baker's twine. I cut a piece of patterned paper that has a woodgrain background and adhered it on an angle to my light grey card base. The panel was adhered at the opposite angle and then I added some of the sequins that came in the Hero Arts kit. The sentiment was stamped on a scrap of the woodgrain paper, trimmed down into a banner and then adhered to the card. Its a bit of a "hot mess", but it is starting to grow on me, lol!! Thanks for stopping by today... would love to know what you think! Hey friends!!! Hope you are enjoying your weekend!! On Thursday (July 7th) I got to see one of my most favorite people the super sweet and super talented Lisa Lara. We usually meet somewhere for a walk and then lunch. While we were having lunch Lisa put forth an idea that I thought would be a lot of fun. 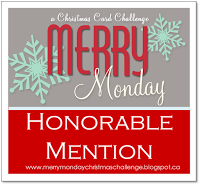 Both of us would participate in the same challenge and then link our cards to each other's blog so you can see how we interpreted the challenge. The challenge we chose to participate in this week is CASology. The cue word at CASology is chevron so I really had to put on my thinking cap to come up with a good idea, but I was excited to give it a go. When I got home I finished up a couple of other card ideas I had going (posted here) and then got to work on my card for the CASology challenge. 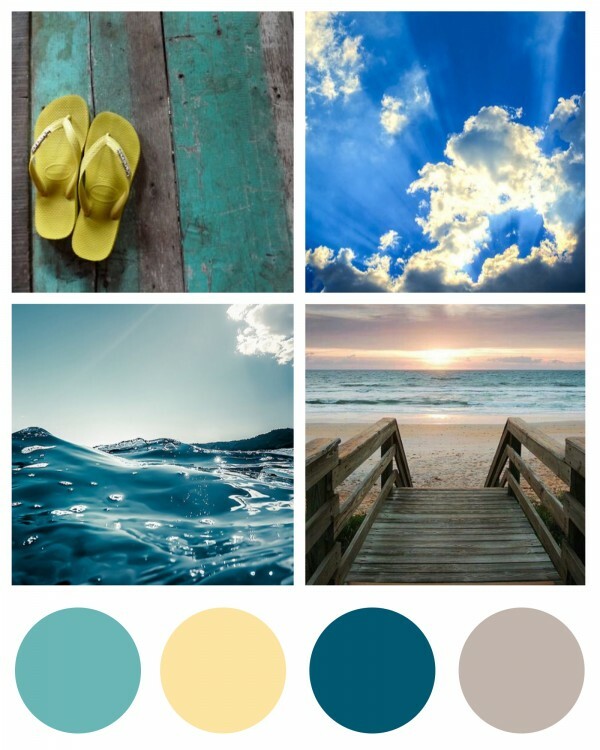 I used the color combo from ColourQ and so I will also be posting my card there. 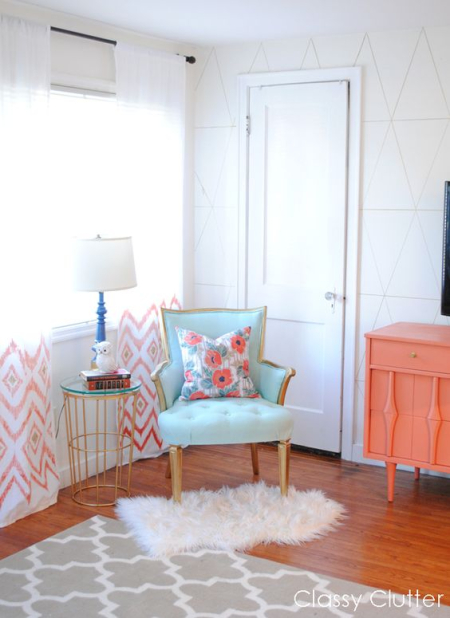 I started by creating a chevron pattern on my white cardstock panel using a Memory Box stencil and SU! 's Marina Mist ink. Then I layered on all the other images from the SU! set Timeless Textures using the rest of the colors from the ColourQ combo. I finished by stamping the sentiment from the SU! set Best Day Ever in black and then die cutting my panel using an A Jillian Vance Design Polka Dot Rectangle backdrop die. 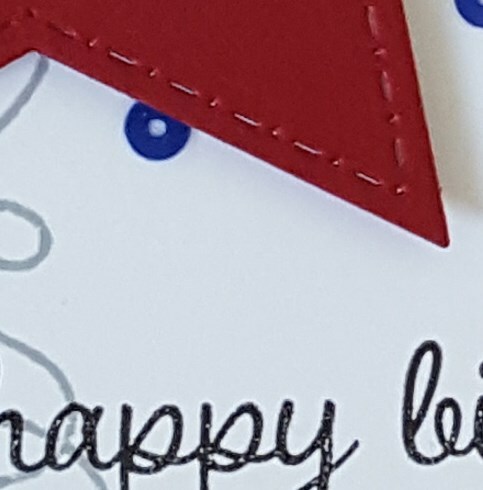 I have included a close up of the chevron background because it is so light. Thanks for stopping by today... I would love to hear what you think of my card and please make sure to head over to Lisa's blog to check out her fabulous design! Hey friends!!! Happy Friday!! I'm popping with a couple of cards today for several different challenges. First up is a card is a card that combines two of my favorite challenges: Freshly Made Sketches and Color Throwdown. I really like flamingos and have for a long time so I'm really loving all the flamingo inspired stamp sets out there. 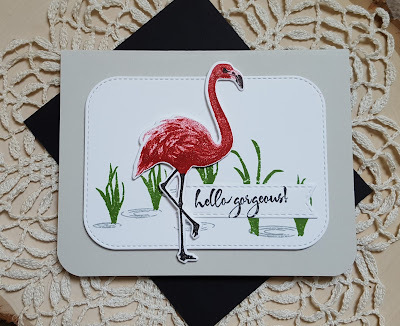 Recently I purchased the Hero Arts Color Layering Flamingo stamp set along with the matching die and I couldn't wait to ink it up. I know that flamingos are not red, but red is one of the colors in the Color Throwdown palette and so I just went with it. I have to say that I really love how my flamingo turned out! I had a bit of panic when I couldn't find the tiny beak stamp, but thankfully I found it!! I used my mini MISTI to help me stamp the body of flamingo. In order to get the variation in the layers of color I inked up the main body image and then stamped it off on scrap paper before stamping it on my cardstock. Then I stamped the second layer at full strength and the third layer was actually stamped twice to get the depth of color needed. 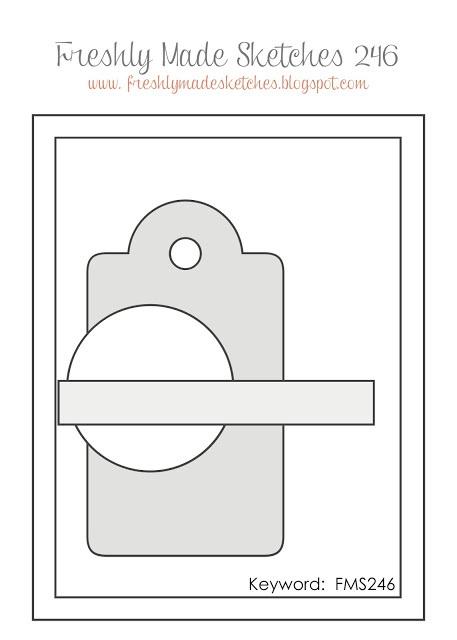 For the oval element on the sketch I used the MFT Inside and Out Stitched Rectangle dies. I added some clear Wink of Stella to the body and it looks really pretty in real life. My second card is for the current My Favorite Things Wednesday sketch challenge. 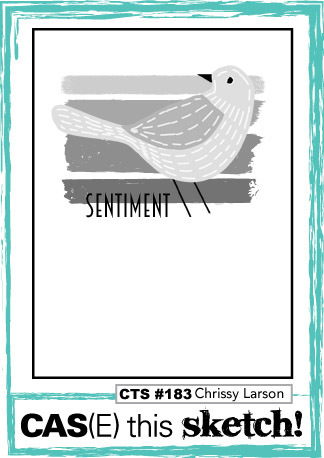 One of the trends lately has been critter stamps. 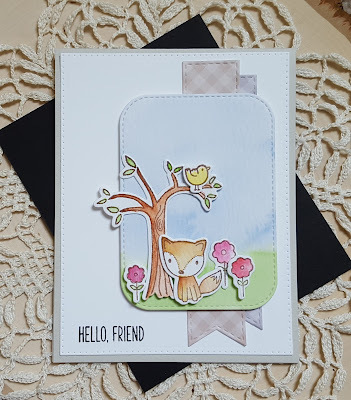 I have resisted buying critter stamp sets because I'm just not that great at coloring, but I stepped outside my comfort zone and purchased one of MFT's cute little critter sets, Sweet Forest Friends, and did some watercoloring. My watercoloring is a work in progress, but I really do like how everything turned out. Initially I tried using my Zig Clean Color markers, but I need more practice with them so I used my Kuretake Gansai Tambi watercolors. All the images were stamped in VersaFine Vintage Sepia ink and then water colored. After everything was dry I die cut the images with the matching dies. A background was watercolored with light blue and green watercolors to create my grass and sky. When that piece was dry I die cut it with a Inside and Out Stitched die. 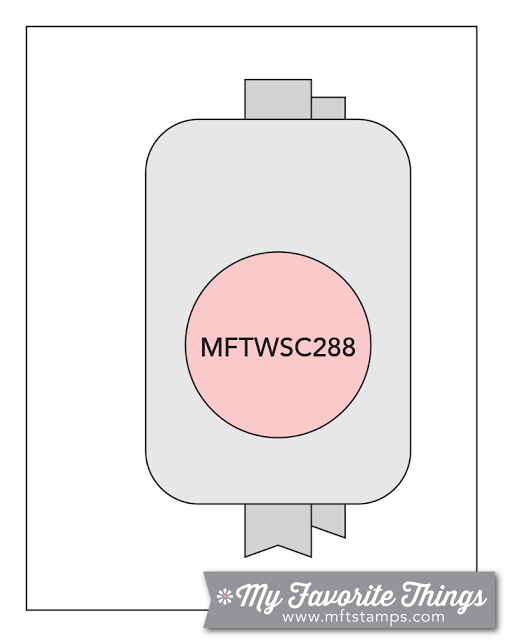 Obviously the round element from the sketch was replaced with my little scene of the tree, fox, bird and flowers. 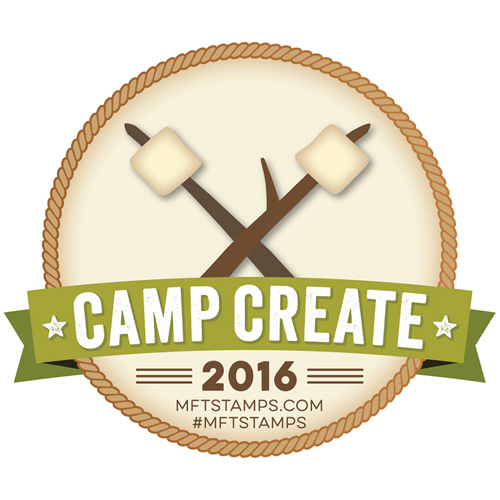 The banners were cut with the MFT Stitched Fishtail Flag Stax die from some MFT patterned papers in neutral colors. Hey friends!! Popping in with a couple more cards that I managed to make today. Actually got both of them mostly done this morning and then took off to spend the afternoon at the Billy Frank Jr./Nisqually National Wildlife Refuge. Boy was that a long walk out to the end of the boardwalk that spans a good portion of the delta! But that walk was worth it as it is so pretty down there! Anywhoo... on to my cards! First up is a card that I made for the current Ellen Hutson Pin-Sights challenge, as well as the current CAS(E) this Sketch challenge. 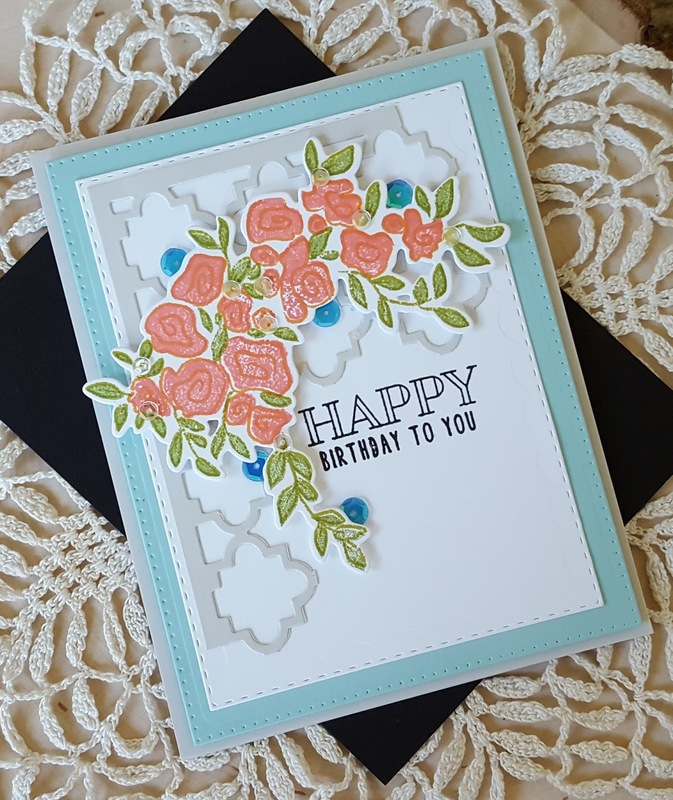 I used three different Essentials by Ellen stamp sets for create my card: Mondo Hydrangea, Mondo Poinsettia and Bokeh Dots. For the Pin-Sights challenge I pulled some of the colors from the inspiration photo to create my card. A small leaf from Mondo Poinsettia was stamped twice on watercolor paper using VersaFine Vintage Sepia. The same was done for the single hydrangea images from the Mondo Hydrangea set. Once stamped I colored them with Zig Clean Color markers and then die cut them with the matching dies. The largest circle image from Bokeh Dots was stamped in kraft ink on watercolor paper, some light brown Clean Color marker was brushed on and then blended out with water. A bit of gold shimmer was added by stamping the same image in Delicata Golden Glitz. 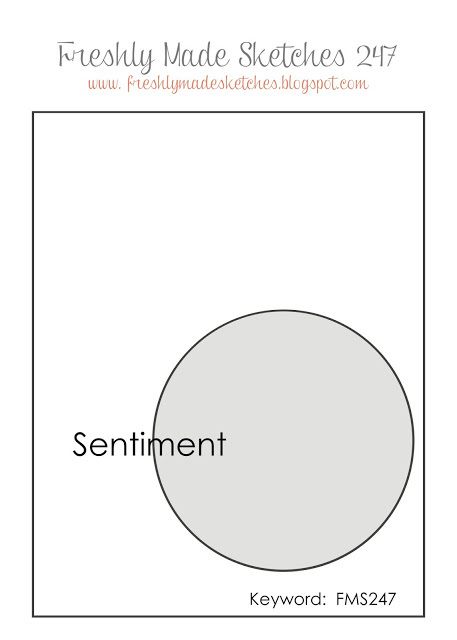 The sentiment was stamped and then everything was adhered. Finished with some light pink, light blue and gold 4mm sequins from Pretty Pink Posh. The second card is for the current PTI Make it Monday challenge. 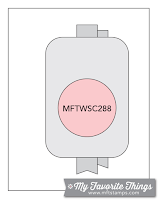 I often think I will play along with the each week's MIM, but most of the time it never happens. I was really intrigued by the technique that Ashley featured I decided I wanted to give it a try. Like my good friend, Greta, it took three tries to come up with one that I liked. I'm not super happy with it as the yellow re-inker I have is Stampin Up's So Saffron and so the yellow is a bit too much brown in it... not the bright sunny yellow I was thinking of for the rays. 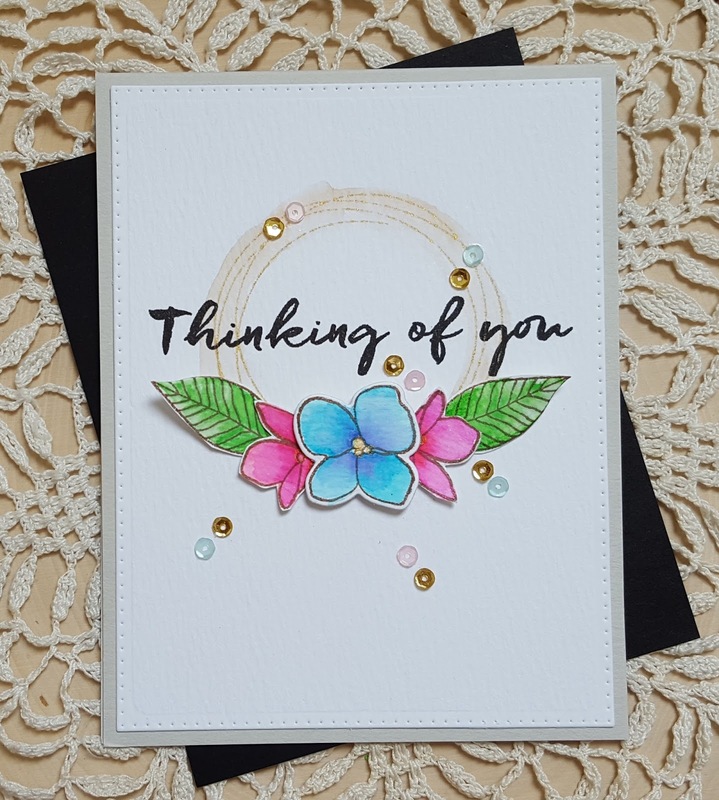 I used one of the stencils from the Sunshine and Rainbow mini Make it Market kit. I did not want the rays to cover the entire card front so the molding paste was only spread to a certain point. Coloring everything was a bit of a trick, but it was fun giving it a try. 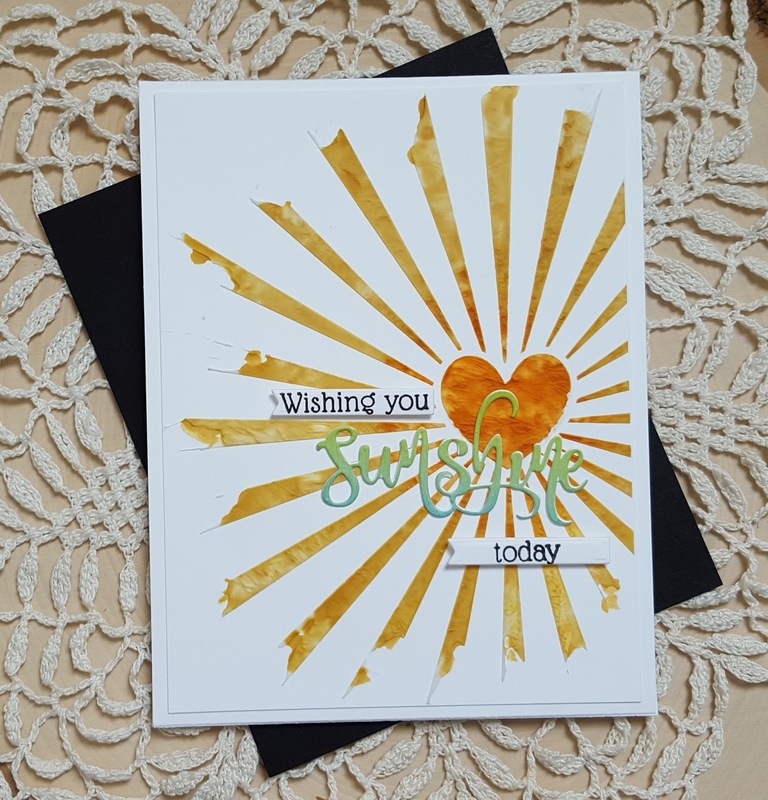 Once the molding paste had dried I glued on the die cut sunshine and the two little banners that I stamped with "wishing you" and "today". I'm also going to add this to the current Simon Says Stamp Wednesday challenge of anything goes.